Want To Know Where Gold Prices Are Headed? Watch the US Dollar! 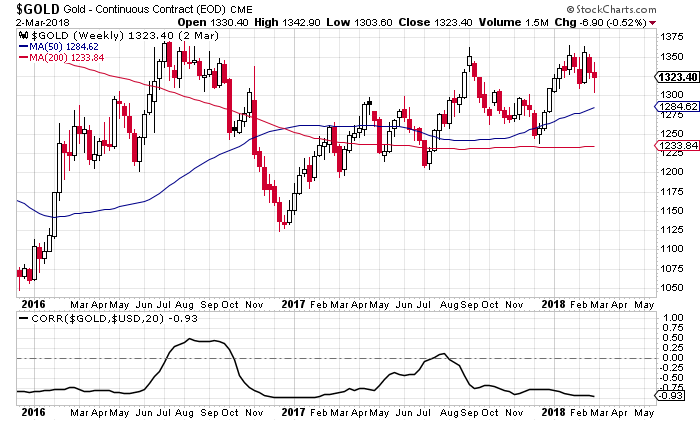 If you are looking for direction on gold prices, it’s important you look at the U.S. dollar. If the dollar declines continue, gold prices could rally significantly. Gold bugs, be happy; the U.S. dollar is declining. Mind you, don’t pay attention to the daily fluctuations. A lot of it has to do with noise more than anything else. Look at the chart below, which plots the U.S. Dollar Index; this essentially tracks the performance of the U.S. dollar relative to major currencies. Also, pay close attention to the blue and red lines drawn on the chart. Right off the bat, the U.S. dollar continues to make higher highs and lower lows. The red line represents the 200-day week moving average of the U.S. Dollar Index, while the blue line represents 50-week moving average. These are basically trend indicators. If the price is below them, it suggests the long-term and intermediate-term trends are pointing downwards. The U.S. dollar index is currently trading below these moving averages. Remember that the trend is your friend. But that’s not all. Notice how the blue line and the red line are about to cross over? Technical analysts call this a “death cross.” When this happens, technical analysts expect bearish sentiment prevailing and prices going much lower, much faster. This is bad for the U.S. dollar, but could be great for gold prices. From a fundamental perspective, the U.S. dollar could drop further. So one could expect gold prices to increase a lot. The U.S. government is still spending without remorse. It wasn’t just a problem during the Obama administration; the Trump administration is really no different when it comes to spending. Its incurring budget deficits and budget deficits are bad for the U.S. dollar. Beyond this, President Donald Trump recently came out swinging at steel and aluminum imports into the U.S. He even talked about imposing tariffs. This is not good for the dollar either. Some are calling for the beginning of trade wars, despite knowing that trade wars may not be very good for the greenback. Dear reader, the U.S. dollar looks weak, and it could get much weaker, given what’s happening these days. Charts and fundamentals are making a strong case for a lower dollar. Now, one could be wondering: what does gold prices have to do with the U.S. dollar? Currently, the correlation between gold prices and the U.S. dollar is -0.93. This is awfully close to having an almost negative inverse relationship. That means that if the dollar falls, gold prices go up. I am currently watching the U.S. dollar index at around 90.0. If it breaks this level, the next support isn’t until around 80.0. If it drops to that low, gold prices could show stellar returns in the meantime. Editor’s Note: Hi, Moe Zulfiqar here. If you enjoyed this article, you can get more of my opinions and commentaries in our popular newsletter, Lombardi Letter. Published daily, it’s FREE! Join us when you click here now.